To mark the World Migratory Bird Day 2010, WWF-Hong Kong organized one of its ten training courses using IT for environmental education. 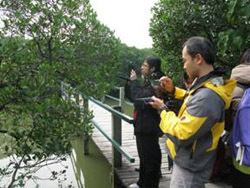 WWF brought conservation and mobile devices together at the Mai Po Nature Reserve to increase educational awareness. Particularly, primary school teachers experienced using a range of mobile technologies. The main focus of the training was the use of mobile technology in the nature reserve, from touch-screen netbooks to digital cameras and internet resources, to assist and inspire teachers to understand and get involved in conservation issues. Increasing interactive activities such as using hand-held devices to calculate bird populations, carrying out experiments with portable digital microscopes, or using webcams to record experiences will bring students closer to the natural environment and further engage them in wildlife protection efforts. WWF will offer another programme to secondary school teachers in September 2010.